Hey I was just wondering if anyone has tried the custom cam grind recommended by George Pence? I’m having my motor rebuilt and I want to try this and most of his mods to make the engine more reliable. Thanks! So this is the camshaft I’m thinking about. George says he believes this is the best all around performance hydraulic flat tappet street cam. George penned this for a very similar build to mine, so it should be pretty close. He calls it the Bullet Cobra Jet Cam. Any thoughts about it would be appreciated. I’m still learning about the Cleveland and open to suggestions. I’m actually thinking about something close to this grind for a hydraulic roller cam. Yes, that should be a good cam for what your intended use is. Should have decent low end, idle, and vacuum. It should work fine with your Q code compression ratio. Your rear-end will put it right in the highway cruise range for it. The only thing, you'll probably want to get a torque converter with a stall in the 2,200 to 2,500 rpm range. (11-30-2018, 06:53 PM)Don C Wrote: Yes, that should be a good cam for what your intended use is. Should have decent low end, idle, and vacuum. It should work fine with your Q code compression ratio. Your rear-end will put it right in the highway cruise range for it. Oh, that’s lower than the one I have. Pretty sure the Q codes were 2800-3000 stall? 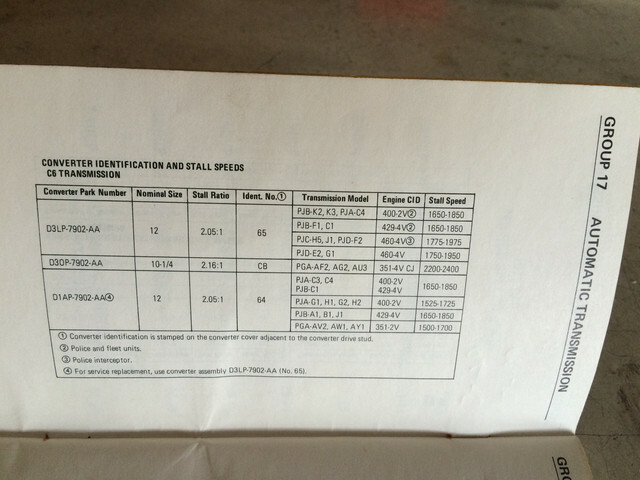 Here is the torque converter specs for a stock 73 Q code, doubt the 72 is much different. Thanks Jeff, but pretty sure 72’s are 2850. I’ll find out for sure. Thanks for the clarification, Jeff. It's higher than I thought, I was thinking they were in the 1600 to 1800 range. 2200 to 2400 should be just right for him. (11-30-2018, 09:02 PM)Don C Wrote: Thanks for the clarification, Jeff. It's higher than I thought, I was thinking they were in the 1600 to 1800 range. 2200 to 2400 should be just right for him. I found a thread by seculf that says stock for 72 is 2850, but I don’t know how to post it from my iPad. Higher is OK, just wouldn't want a lower stall speed. It's just desirable to have the stall speed at or a little less than the highway cruise RPM.